My husband loves his workspace in the garage, I love my little office, our littles love their play area in the basement. These areas speak to us and call to our identity, but we ALL LOVE THE KITCHEN. It’s the heart of the home and the hub of activity. It’s where we congregate as a family or with friends. It is where we share our life, laugh and dance, and cook together. The kitchen is often considered the most important room in a home. A well-organized kitchen makes the room neat and tidy, easy to maintain, and functional for an entire family. Let’s take a look at how to organize every space in your kitchen. Of course, we’d start with food…it’s one of the main drivers for people to come to the kitchen. This post has great tips on how to organize your refrigerator. 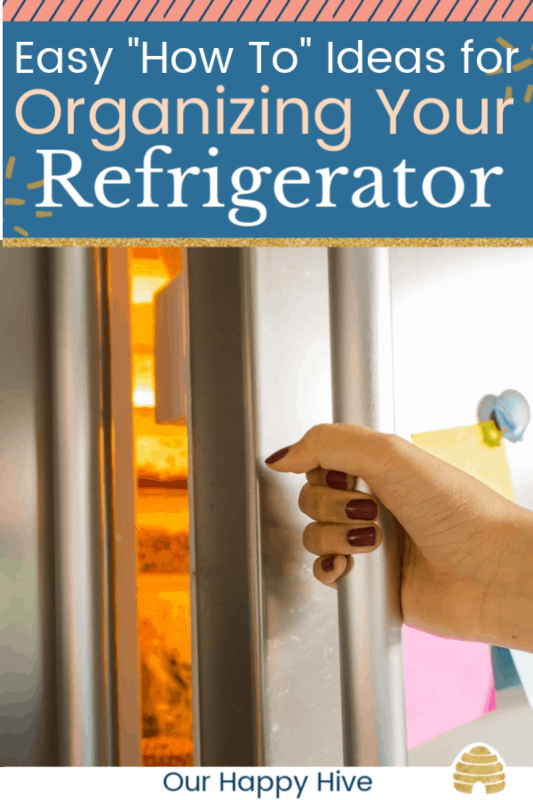 It includes information about fridge zones and storage areas, foods that shouldn’t be refrigerated, and ideas that will help your whole family keep the refrigerator organized! It’s perfect if you’re organizing your kitchen or doing a quick declutter. Sticking with the food theme, let’s move on to how to organize your pantry. White bins with back labels, glass canisters with baking ingredients, and cans all in a row are the nuts and bolts of an organized pantry. As a busy mom with two little kids, I need easy and practical. Often that means projects I can do a little at a time as my schedule permits. 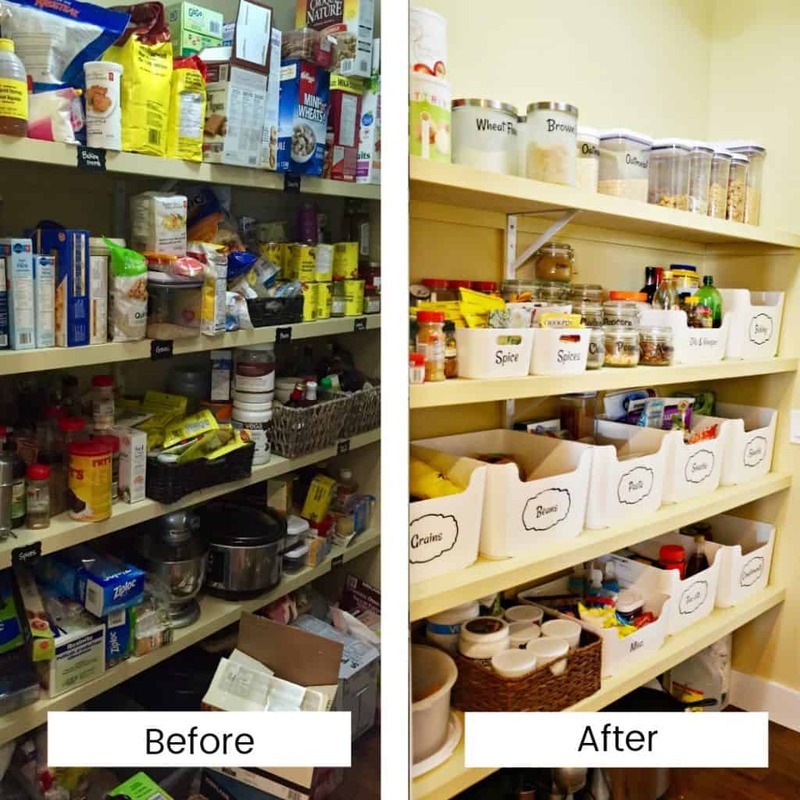 This popular post highlights 5 simple steps for organizing your pantry. There are also a few tips on how to maintain the organization. Seriously, it’s so easy, you can start it today! For years, I tried to find the perfect storage solution for my spices. As my spice collection grew, it became more and more challenging to keep it straight. 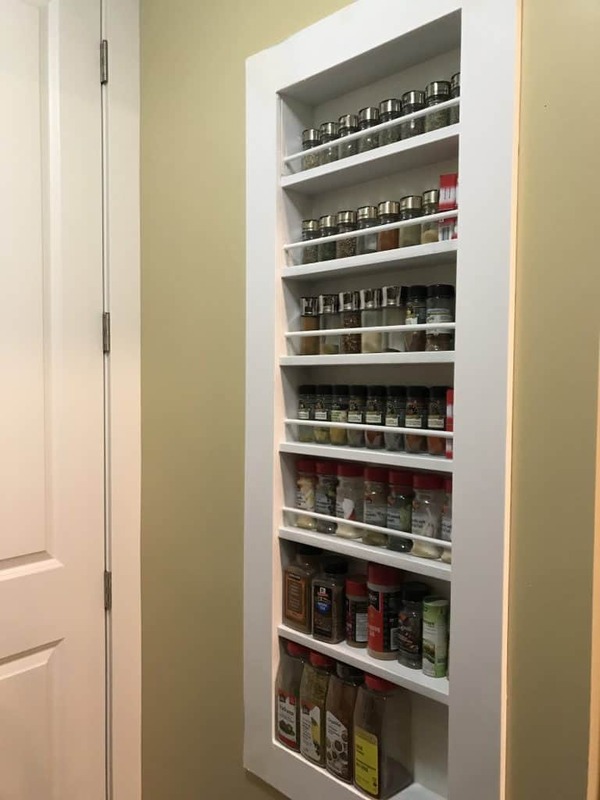 If you’re tired of trying cheap solutions that don’t work in the long run, maybe you’re ready to take on a DIY Built-in Spice Rack. I love this spice rack that my husband built. It was an easy weekend project and my spices haven’t been the same since! Check out this simple DIY built-in. Before we move on to another part of the kitchen, let’s touch on one more food related item. Even if you have an organized pantry, it’s easy to be surprised by expired foods. 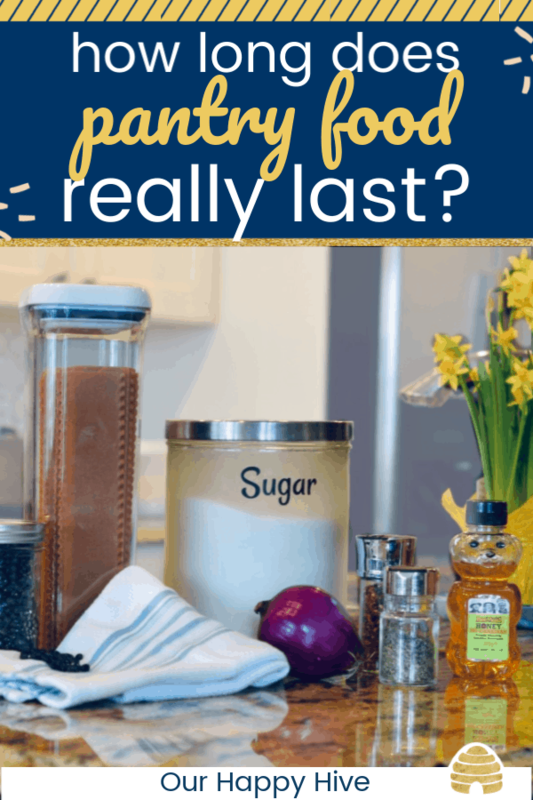 This post has great tips about how long pantry food lasts. 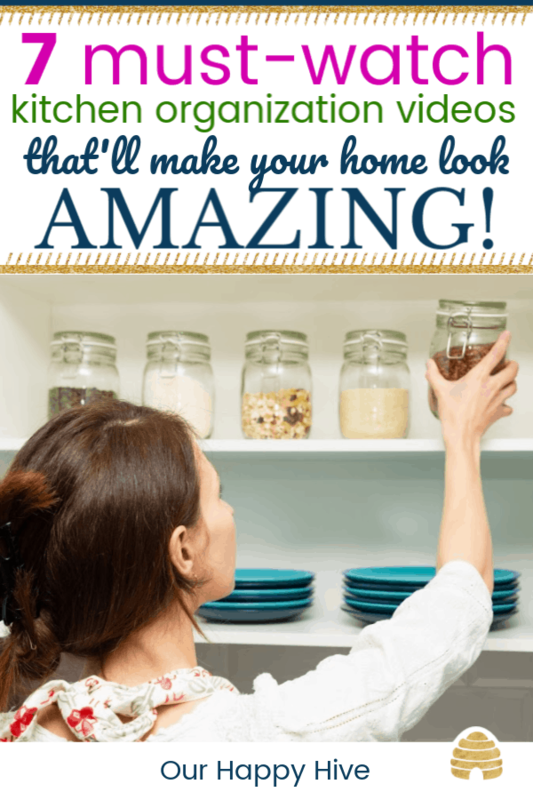 It covers the most common pantry items, their REAL shelf life, and a few tips, hacks, and best practices. It even has a free printable! 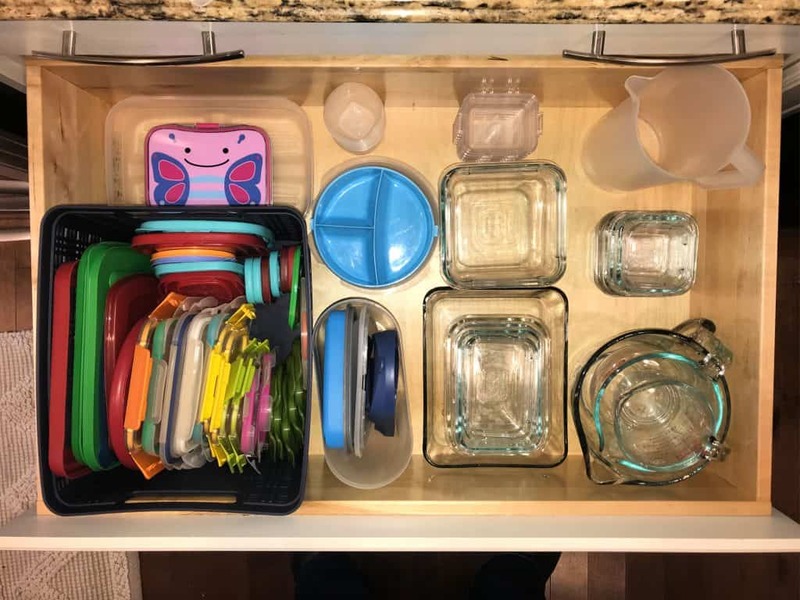 Now that we’ve covered food we’re going to move on to some popular areas in a kitchen including plastic storage container organization, the secret junk drawer, and the medicine cabinet. Every household typically has a myriad of plastic or glass food storage containers for leftovers or lunches. These items can easily become out of control. Before you know it, you have mismatched lids, containers without lids, and a hodgepodge of clutter. Check out this post for easy to implement solutions. 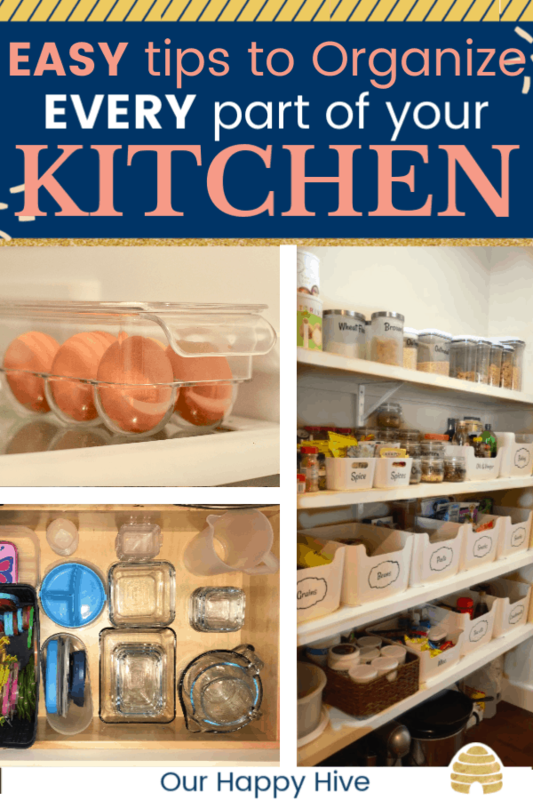 This is a simple kitchen organization idea that doesn’t take much time. 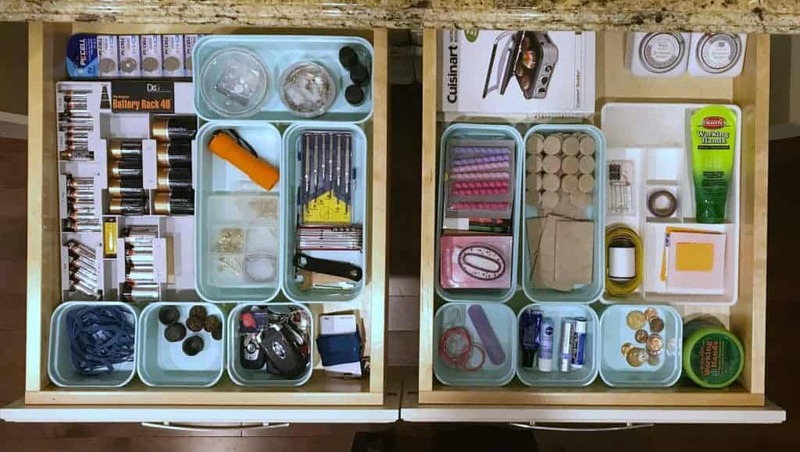 Make your containers easy to access with these simple organizing hacks. I know about your little secret…that hidden junk drawer you don’t ever talk about! We all have one. These drawers are usually filled with a bunch of things that don’t have “homes.” It’s also often a wide variety of miscellaneous items leaving us with a feeling that it’s impossible to organize. Many people keep their medicines in their kitchen above the refrigerator or in a cabinet. About a year ago, we organized our medicine cabinets in bins with labels and sorted by category. I love it that when someone is sick in our house I know exactly where to go to get the thing they need. Tummy trouble…no problem, possible fever?…let me check. It seriously minimizes the stress that a mom can feel when they are concerned that one of their littles is coming down with something. 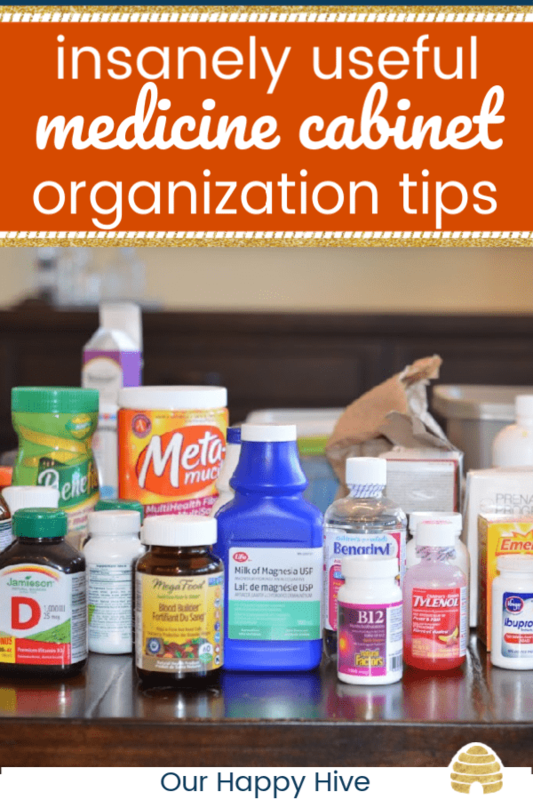 Check out this post for helpful tips, practical ideas, and easy steps to organize your medicine cabinet. With these helpful how-to tips, you’ll have a well organized, easily accessible, and safe medicine cabinet. We’ve talked about some really common areas with a myriad of uber-practical tips. Now let’s take a look at one post that includes some very visual inspiration! Who doesn’t love a good YouTube video? I’ve hand-picked these videos to give you ideas for every part of your kitchen. There are ideas for decluttering, practical tips, and helpful hacks to help you get your kitchen in order. The videos are short and will give you a ton of new ideas. From food organization to decluttering and tidying, this post covered a lot! The kitchen is such an important space where families spend a ton of time. Make it even more enjoyable by organizing it in such a way that everyone knows where the things are that they need on a daily basis.